Piranhas have the reputation of being among of the fiercest predators in the aquatic realm. While they certainly will make short work of any meat they come across, piranhas enjoy a varied diet and will eat almost anything. In the wild, piranhas' usual source of food is the fins and scales of other fish. 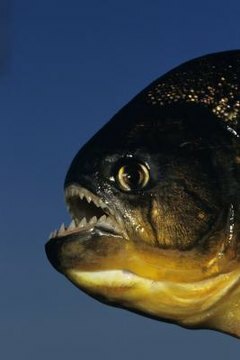 A single piranha will dart in, take a bite, and then flee to avoid reprisal. When piranhas grow into adulthood, they begin to hunt in shoals of around 20 fish and will attack a larger animal en masse. They may attack land animals that venture into the water to drink or bathe, and they may feed on carcasses in the water left over from other predator attacks. During appropriate times of year, piranhas may feed on vegetables and fruits that make their way into the water, or graze on aquatic plants to make up energy after a lean hunt. Piranhas in captivity should have a diet that mimics what they would find in the wild. Frozen and freeze-dried meats, leafy green vegetables, potatoes and gourds, and commercial fish food are all suitable for the captive piranha diet.